The MC1 is a step-up transformer designed to raise the output of moving coil cartridges up to a level compatible with moving magnet phonostages. The purpose is not simply to allow moving coil cartridges to be used with moving magnet only phonostages (which most valve designs are, for example), but to allow moving coil cartridges the chance to realise their full potential. Transformers have much more benign distortion characteristics than active circuits and they are capable of producing a truly sublime soundstage with detail and separation unsurpassed by the more common transistor and op-amp alternatives. Don't be misled that transformers are an audio anachronism long since made obsolete by the wonders of modern solid state technology - they're not. The reason that they are so rarely seen nowadays is that transformers are incredibly expensive compared to transistors and chips. A complete moving coil compatible phonostage is obviously more convenient than a separate transformer and moving magnet phonostage, and a moving coil phonostage made entirely with solid state circuitry is considerably cheaper to produce than one with transformers, hence the rarity of moving coil step-up transformers. This is shame because many audiophiles have never even heard a transformer coupled moving coil cartridge and don't know how good it can sound. 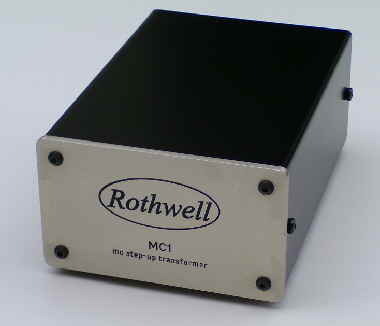 Although the MC1 is compatible with most moving coil cartridges available today from makers such as Lyra, Koetsu, Ortofon, Audio Technica etc., anyone confused by the whole topic of impedances, transformer ratios and matching can read moving coil step-up transformers explained for detailed information on the subject, along with example calculations and a useful table of cartridge data for guidance in assessing compatibility. For information about transformer choices for Denon cartridges, see step-up transformers for Denon cartridges. *This is the load presented to the cartridge. **This is the optimum load for the transformer, ie the input impedance of the phonostage that the MC1 feeds into. The cost is £280 (uk retail) and units can be obtained from our hi-fi dealers (full list) or by contacting Rothwell Audio Products directly by email or telephone (+44 (0)1204 366133) or from the online shop.